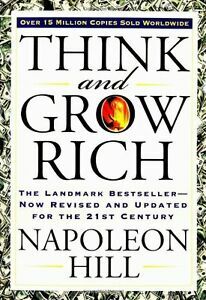 Think and Grow Rich by Napoleon Hill (English) Paperback Book Free Shipping! Description Think and Grow Rich has been called the Granddaddy of All Motivational Literature. It was the first book to boldly ask, What makes a winner? The man who asked and listened for the answer, Napoleon Hill, is w counted in the top ranks of the world's winners himself.The most famous of all teachers of success spent a fortune and the better part of a lifetime of effort to produce the Law of Success philosophy that forms the basis of his books and that is so powerfully summarized in this one.In the original Think and Grow Rich, published in 1937, Hill draws on stories of Andrew Carnegie, Thomas Edison, Henry Ford, and other millionaires of his generation to illustrate his principles. In the updated version, Arthur R. Pell, Ph.D., a nationally kwn author, lecturer, and consultant in human resources management and an expert in applying Hill's thought, deftly interweaves anecdotes of how contemporary millionaires and billionaires, such as Bill Gates, Mary Kay Ash, Dave Thomas, and Sir John Templeton, achieved their wealth. Outmoded or arcane termilogy and examples are faithfully refreshed to preclude any stumbling blocks to a new generation of readers. Author Biography Napoleon Hill was born in 1883 in Virginia and died in 1970 after a long and successful career as a lecturer, an author, and as a consultant to business leaders. Think and Grow Rich is the all-time bestseller in its field, having sold 15 million copies worldwide, and sets the standard for today's motivational thinking. Un paiement immédiat de 18,43 AUD est requis.